Place the vegetables on a baking tray and toss in the rapeseed oil, season. Place under a preheated grill for 10-15 minutes, turning the vegetables occasionally. Heat a little rapeseed oil in a 20cm frying pan and add a little of the batter, swirl the pan to form a thin layer coating the base of the pan. Cook for 1 minute on each side or until golden. Repeat to make 8 pancakes, separating them with squares of baking parchment. 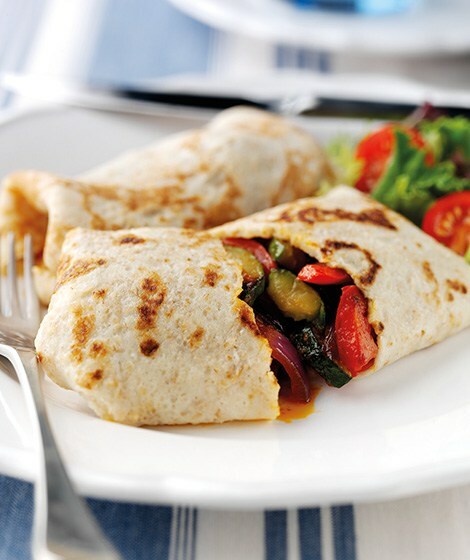 Stir the tomato paste into the vegetables and spoon in the centre of the 8 pancakes, fold in the sides then roll into a parcel. Add some diced, smoked back bacon with the vegetables for a meaty version. For extra flavour, try adding chilli powder or torn fresh basil.